OK, we all know the Rupert Holmes ditty called Escape, a/k/a The Piña Colada song. You know: “If you like Piña Coladas/And getting caught in the rain.” That’s not the escape I’m talking about. What I have in mind is the sort of weekend where you go to a nice, exotic location — preferably one with a beach — and relax with a tall, cool, refreshing drink (and forget about the rest of the world). Or if that’s not possible, one where you stay at home and camp out in your back yard with the same tall, cool, refreshing drink (and forget about the rest of the world). 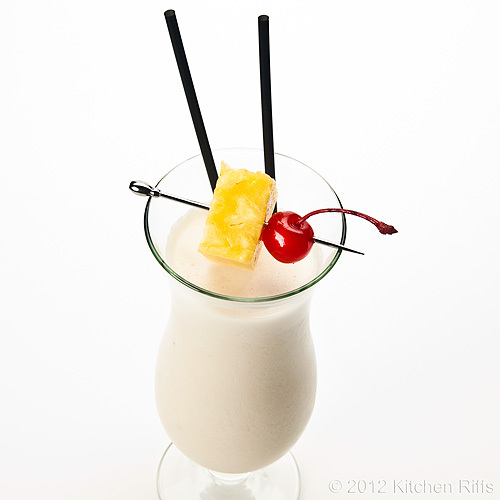 Enter the Piña Colada: Tall, cool, and refreshing. With excellent flavor and super good looks. Ready to unwind? The Piña Colada is the official beverage of Puerto Rico. It was created there — at the Caribe Hilton’s Beachcomber Bar in San Juan — sometime in the 1950s by Ramón Marrero, one of the hotel bartenders. Although you can make this drink in a cocktail shaker, it’s better when mixed in a blender. Indeed, this was the first frozen drink designed with the blender in mind. Other drinks we commonly see in frozen form (the Daiquiri or Margarita, for example) are actually better when they’re shaken and served “up,” not frozen. The Piña Colada’s distinctive flavor comes from the combination of pineapple and coconut cream, specifically Coco López Cream of Coconut. (There are other brands out there, but this is the original and best; you can find this at virtually any grocery store). The rum used in the original drink was white Puerto Rican rum. I prefer to use a combination of white and dark rum (I discuss some recipe variations in the Notes). This recipe serves 1, and takes about 5 minutes to prepare. I adapted it from Dale Degroff’s The Craft of the Cocktail. Add all ingredients (except the garnish) to a blender container. Cover and blend on high until the drink forms a nice, thick emulsion — about 15 to 30 seconds. Pour into a tall glass, and garnish with optional maraschino cherry and/or pineapple wedge (or whatever you want). Long straws make this easier to drink. Including cream as an ingredient helps form a longer-lasting emulsion, and also makes for a more interesting flavor. I think my recipe is the best way to mix this drink, but other people have different ideas. David Wondrich likes to use 2½ ounces of gold rum, 3 ounces of pineapple juice, and 1 ounce of coconut cream. Then he blends with ice. He also suggests floating ½ ounce of Cherry Herring on the drink for extra eye appeal (pour it over the back of a spoon so it floats on top). Robert Hess likes 2 ounces of white rum, 6 ounces of pineapple juice, 1 ounce of coconut cream, and 1 of ounce heavy cream. Blend with ice. 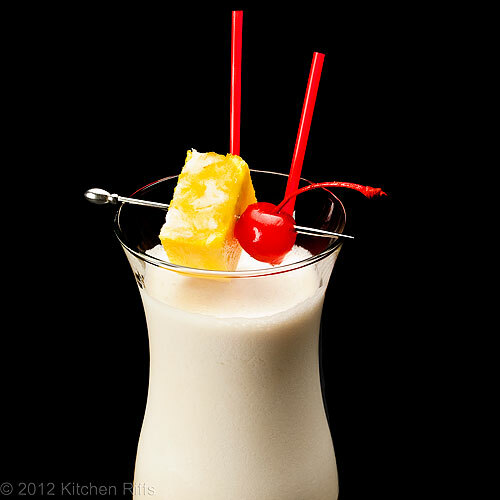 Gary Regan, in the Joy of Mixology says that when he makes a frozen Piña Colada, he likes to use 2 ounces of dark rum, ½ cup of pineapple cubes (or 2 ounces pineapple juice), and 1½ ounces of coconut cream. My recipe is essentially the same as Dale DeGroff’s, but he prefers to use 2 ounces of coconut cream and 4 ounces of pineapple juice. He also likes a dash of Angostura bitters. Lots of recipe choices out there! If it’s a really long weekend, you can make one of each — then compare and contrast. And it’s true. Often when we’re on vacation (at some exotic destination or on a cruise), this is the cocktail that Mrs K R orders. “You’ll be glad to know that I bought plenty of Coco López,” I said. “And extra little cans of pineapple juice. So we can make these whenever we want.” The rum and heavy cream we always have on hand here at Bar Kitchen Riffs. quickly. But you need to be careful, because they have a goodly amount of alcohol in them. And we drank to that! My family vacationed for years at the Caribe Hilton and I always got their Piña Coladas. I never knew it was their creation but do remember how tasty they were. In fact I'm not much of a drinker but when I drink if it's not wine it's Piña Coladas. I just have to watch it so my waistline doesn't expand. Thanks for sharing this recipe. I can't wait to try it. I don't think I've ever enjoyed a Piña Colada where I wasn't poolside, or even in the pool, and, hopefully, with the sounds of a roaring surf in the background. It just wouldn't be right to drink one anywhere else. Hi Vicki, Mrs K R always liked ordering this drink back before we were interested in cocktails simply because it was so pretty and delicious. It is rather fattening, though - definitely not something one would want every day. Thanks for your comment. Hi Juliana, the traditional recipe is without cream, but I think the cream adds so much to it. Thanks for your comment. Hi Chicago John, you're right - it might not be legal to have one of these unless you're in some exotic spot! Thanks for your comment. Hi CCU, the mock tail version is really good - you'd definitely enjoy it. Thanks for your comment. Hi Mariana, wow, and school just started! But I agree, even without a beach this is a wonderful drink. Thanks for your comment. I did a little jump when I saw this post. Okay, maybe a little *big* jump. I love pina colada, and I love excuses to travel to the local beach and pretend like I'm on a real vacation (instead of one long, extended staycation). I'm definitely bringing a virgin version to the seashore--thanks so much for sharing! Can you see my tears from there?? I would sell my right leg for some Coco Lopez!!! Oh how I wish it was available here in Australia. I brought a commercial drink machine from my son's old restaurant to Australia with me and I had Coco Lopez shipped in. During the hot summers down south (really hot and dry) my Piña Colada parties were legendary. I have to say you make one tasty looking cocktail. 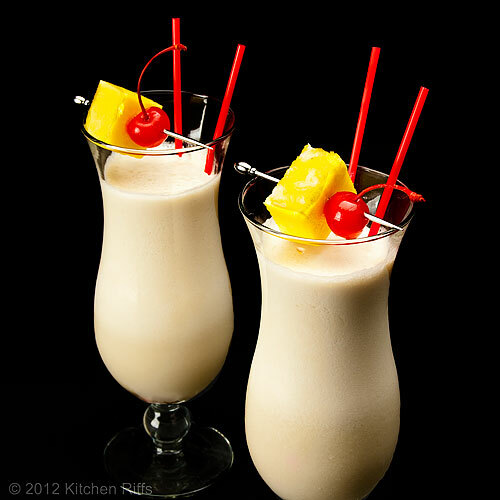 Pina Colada is one of my favs too, makes me want to go the beach hang out and enjoy one right now. Hi wallflourgirl, glad this post has made you happy! It's a great cocktail, isn't it? Have a great time at the beach! And thanks for your comment. Hi everydaymaven, there's just something about this drink that screams "vacation," isn't there? Must be because it's so pretty and such a smooth drink. Thanks for the comment. Hi Zoe, the "family" version of this is pretty tasty - your little boy certainly will enjoy it. And you'll enjoy the grown up version! Thanks for the comment. Hi Maureen, no Coco López in Australia? That's terrible! Maybe you can set up a business importing it? ;-) Mrs K R would have been all over that milk shake-sized Piña Colada! Thanks for your comment. Hi Gina, isn't it a great drink? Great pineapple and coconut flavor - so refreshing. Thanks for the comment. Hi Carolyn, these beauties are pretty caloric so both wicked and indulgent are pretty good words to use! But one feels so happy drinking these, doesn't one? ;-) Thanks for the comment. Hi Kristi, aren't they great? And the pool is a great place to drink them. I could use one right now too! Thanks for commenting. Hi Suzanne, these really are like a dessert. But as you point out, one you can't overindulge in without consequences. Thanks for your comment. Love this drink, plus it really makes a statement. Perfect. I know you I've told you this already but you're now my go to cocktail blog! 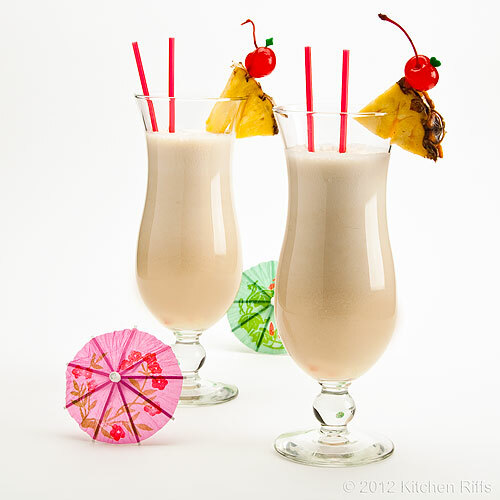 the pina colada looks absolutely fantastic! Hi Tania, isn't it great? One of those classics that never gets old. Thanks for the comment. Hi Baker Street, it's such a nice drink. Thanks for the kind words, and the comment. I'm with Mrs. KR - It's about time you featured these! :) I've always considered pina coladas a guilty pleasure because I love them so much I could drink them all day (with the alcohol of course). However, I have never made one! Hum! I didn't store my blender away for the remodel, so Friday afternoon on the front porch with pina coladas - Sounds like a plan to me! I'm going to steal Mrs. KR motto - I love it! Hi MJ, I know I know - I'm hanging my head in shame because I haven't featured this drink much sooner! It's a swell drink. Friday on the front porch with Piña Coladas sounds like a terrific plan! I'll have to tell Mrs K R - we may be doing the same! And isn't that motto great? It's one we both enthusiastically embrace. Thanks for your comment. Hi Jeanne, I'm always ready for a tropical vacation! But I have to settle for an evening at home. ;-) Thanks for your comment. Hi Cathleen, how could you not think of that song? It's burned into all of our memories, we've heard it so often. Thanks for the kind words, and the comment. I would love to have one these for the weekend. Sounds great! Hi Words of Deliciousness, I hope you get one for the weekend! It really is a terrific drink. Thanks for your comment. Hi motherrimmy, time for another, don't you think? And Seattle has had only 2 weeks of sunshine this summer? That's remarkable. We've had almost nothing but sun - hot and dry. Thanks for your comment. One of my favorite summer drinks! Hi Jen, Mrs K R agrees! It's got great flavor + great looks — what more could one want? Thanks for the comment. I was waiting for your Piña Colada recipe as I'd been feeling like one lately!! What good timing. Hi Amanda, I hope this has encouraged you to have one! Thanks for your comment. Pina coladas are one of my favorite drinks. As a child my mom would make us virgin versions that were incredible. Of course all our friends from the neighborhood came over for some too:) Thanks for sharing, love your photos! Hi Spicie Foodie, this is one of those drinks where the nonalcoholic versions are almost as good as the ones with booze. I'll bet your childhood friends were wild for the ones your mom prepared! Thanks for the kind words and the comment. I loveee pina coladas! Yours looks so much creamier and prettier than mine. :P So praying that warmer weather will be upon us soon so I can enjoy this beautiful drink without having the heater on! Hi Marta, great spot for a vacation! Sounds like one of these drinks is in your future! Thanks for the comment. Hi Raymund, then this post is timely for you - you can drink to the nice weather! Thanks for the comment. Hi Jay, it's really a nice drink - so refreshing. Thanks for the kind words and the comment. Hi Jenny, adding the cream really helps with the emulsion - in particular, it lasts a bit longer. Hope your warm weather arrives soon. Thanks for the comment. Although I don't drink all kinds of drinks, Piña Colada is one of drinks I enjoy! I didn't know what's really in it, so it was interesting to see the ingredients! Haha I wasn't aware it's quite high calorie though. It's alright, whenever I drink, I indulge myself and enjoy! The first picture is mesmerizing - what a beauty! Hi Nami, yeah, this is kind of a caloric drink. But now again you need something like this! Thanks for the kind words, and for taking time to comment.